Climbing roses add a gorgeous wall of color to the landscape with their canes being trained up trellises or fences. Sometimes the climbing rose has either outgrown their location or perhaps is being overcrowded by other plants and needs to be moved. Transplanting a climbing rose bush requires a little know-how to keep it growing well once moved, but overall is relatively easy to do. 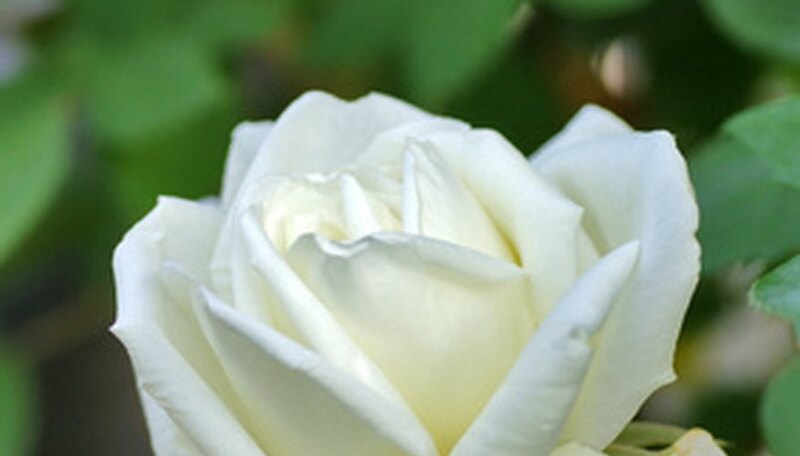 Using a shovel, dig up your climbing rose bush when it is in the dormant stage either late winter or early spring. Water the plant daily for a week before moving it to make it easier to dig up. Use a slow trickle of water and water just long enough for the soil to become moist. Prune back the canes for easier handling and moving. After cutting the canes back to about 3-feet tall, gently remove the canes from their support and tie them together with a piece of twine or nylon to hold. Cutting the canes back will reduce the amount of blooms for this season, but it will produce more the following year. Carefully dig around the bush about 18 feet in diameter to keep as much of the roots intact as possible. Push the shovel into the soil at an angle and gently loosen the roots. Gently lift the bush out of the hole and shake off any excess soil from the roots. Set the plant in a bucket of water until ready to plant. Replant within 24 hours after removing the bush from the original site. Prepare the new planting site before digging up the rose bush. Dig a hole that is about 2-feet deep and wide. Make a mound of dirt in the bottom of the hole and add a liquid transplant shock prevention formula to the hole before planting the bush. This can be purchased at most local garden stores. Set the rose bush in the hole, spreading the roots over the mound of dirt. Be sure the graft union is about 2 to 3 inches above the ground surface. Fill the hole halfway with soil, then water slowly to help the soil settle. Once all the water has soaked into the soil, finish filling with soil—mounding soil around the stem and firming over. Water your newly transplanted bush consistently every three to four days for the first couple of weeks. Use a slow stream of water from a garden hose or a drip irrigation system and be sure the bush gets approximately four gallons of water weekly. Add a 2-inch layer of mulch to help protect the newly transplanted roots and hold in moisture until well established. Use shredded bark or pine needles. Amy Hannaford teaches childbirth education classes and a healthy pregnancy series in Southern Oregon. Hannaford holds an Associate of Arts degree, a certificate in medical assisting, and has been a childbirth educator and birth doula for 20 years. She has been writing articles for Demand Media since 2008.